HALIFAX, NS – The Atlantic Institute for Market Studies (AIMS) today released a public policy study concerning investment trends in Atlantic Canada. Private Sector Investment in Atlantic Canada examines several forms of capital investment, including machinery and equipment outlay, business non-residential structures and government capital spending. Capital investment is a leading indicator of export demand and economic health. The study is coauthored by Dr. David Murrell, an Honourary Research Professor in Economics at the University of Prince Edward Island, and Jackson Doughart, a policy analyst at AIMS. 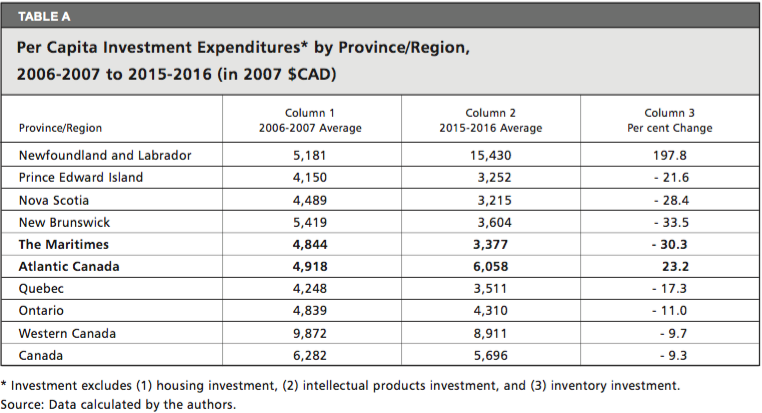 Employing Statistics Canada’s investment intentions surveys, the paper establishes two quite different investment histories in Atlantic Canada, from the two years prior to the Great Recession to the present. Investment in the Maritimes has dropped significantly in the last ten years. In Newfoundland and Labrador, meanwhile, public investment and industrial structures have increased significantly over the same period. The Maritimes have recorded the weakest performances in real per-capita business spending in Canada. Total per-person real outlay fell from $4,844 in 2006-2007 to only $3,377 in 2015-2016, a worrisome 30 percent decline. The Maritimes’ public infrastructure spending has remained roughly constant. Meanwhile, real business machinery and equipment expenditures have fallen by 35 per cent, and real business non-residential spending has fallen by 55 per cent. Investment in Newfoundland and Labrador has soared dramatically since 2006-2007, tripling from $5,181 to $15,430 per capita. Much of this strong increase comes from public sector capital outlay (an increase of more than 400 per cent) and business non-residential spending (an increase of more than 200 per cent). However, increased public spending has now wrought negative consequences for the province’s debt and deficit situation. The Maritimes’ poor business investment picture can be attributed in part to bad public policies. Governments have raised taxes, registered increasing provincial government debt and halted lucrative shale gas development. The sharp decline in business investment spending points to slower economic growth, over the medium and long term, for the Maritimes.